Why would big-time global media tycoon Rupert Murdoch meet with Prime Minister Stephen Harper to discuss how miniscule Canadian media tycoon Pierre-Karl Péladeau could set up a Quebecor Media television knock-off of Murdoch’s Fox News channel? The answer is that he wouldn’t — and didn’t. Even Kory Teneycke, who was Harper’s chief spokesperson at the time and was at the lunch meeting in New York on March 30, 2009, claims the Quebecor venture was not discussed. That hasn’t stopped Teneycke, the huckster for the project, from piggybacking on the Fox News brand. Four months after the meeting with Murdoch, he left the Prime Minister’s Office and almost immediately obtained a contract with Quebecor to develop a conservative television channel. Teneycke, who has worked for the Reform party, Mike Harris’s Ontario Tories and the Saskatchewan Party, may have coined the phrase “Fox News North” to attract attention and put it on the political agenda. And he certainly did. Mainstream media and the blogosphere are humming with strident commentary, both for and against. Google “Fox News North” and you’ll come up with over 750,000 hits. But, like Victor Frankenstein in the Mary Shelley thriller, Teneycke created a monster that in the end consumed him. The controversy became too hot for his corporate masters and he resigned, replaced by public relations executive and former Brian Mulroney spokesperson Luc Lavoie. But back to Murdoch. A clue to the real reason for the Harper-Murdoch lunch was provided — inadvertently — by libertarian ideologue Tasha Kheiriddin in an open letter she wrote to Margaret Atwood in the National Post. She berated the Canadian literary icon for signing a petition calling on the government not to allow Fox News North to proceed. Kheiriddin is wrong. Think plot, not compliment. There’s one big difference between Harper and the other politicians Kheiridden mentions. Murdoch owns media properties in their countries — Australia, the U.S. and the U.K. He owns none in Canada — so far. It is well-known that Murdoch meets with national leaders to advance his corporate interests. In a blog posting in December 2008, Georgia Straight editor Charlie Smith reported on a biography of Murdoch that focused on “how the media baron ingratiated himself with political leaders, who helped him build his empire. “Don’t be surprised if Prime Minister Harper pays a quiet visit to Murdoch the next time Harper happens to pass through New York City, where Murdoch spends most of his time,” Smith presciently wrote. Four months later Harper paid the quiet visit. And the visit would have remained quiet except for the diligent digging of a resourceful Canadian Press reporter who searched mandatory disclosures filed with the U.S. Justice Department by Ari Fleischer, media consultant and former George W. Bush press secretary. As a result, the get-together hit the front pages. The Fox News North story received the ink, but what Murdoch wants from the prime minister — and can give him by way of support — may be a more important story. Murdoch — along with other non-Canadian media owners — has so far been stymied in his quest to penetrate the lucrative Canadian media market. One roadblock is Section 19 of the Income Tax Act, which allows advertisers to deduct their costs of advertising in Canadian newspapers only when the paper is 75 per cent owned by Canadians. Since newspapers obtain about 80 per cent of their revenues from advertising, this requirement effectively kills foreign control of Canadian newspapers. As well, Broadcasting Act regulations exclude non-Canadians from owning radio or television stations. A non-Canadian is defined as any broadcaster whose foreign ownership exceeds 33.3 per cent of voting shares at the holding-company level. A country’s restrictions haven’t stopped Murdoch in the past. He gave up his Australian citizenship to become an American so he could own American television stations. He divorced his wife of 30 years and married a Chinese national half his age, which seemed to give him leverage in prying open the Chinese satellite-TV market. What will he do to get into Canada? Whatever he has up his sleeve, don’t expect it to happen overnight. Murdoch is patient and persistent. Working in his favour is the fact that neither Section 19 nor the Broadcasting Act regulations are as much of an impediment to foreign ownership as they once were. Lock enough lawyers and financiers together in a room and they’ll soon find a way to subvert the goals of the legislation. That’s what happened to the CanWest Global media empire, which was owned by the Asper family — all lawyers themselves. The company opened the door to significant foreign control with its 2007 deal to buy the 13 specialty cable channels of Alliance Atlantis Communications for $2.3 billion. CanWest put up only $262 million of the purchase price, with the balance coming from the notorious Wall Street financial dealer Goldman Sachs. The company promised not to exert control. Right! Perhaps forgetting Lord Chesterfield’s dictum that “he who pays the piper calls the tune,” the Canadian Radio-television and Telecommunications Commission believed them and allowed the deal to proceed. Then, after the company crashed and burned, the newspaper holdings were sold to a company called Postmedia Network, which now controls most of Canada’s major metropolitan dailies, including the Ottawa Citizen, Montreal Gazette, Calgary Herald, Edmonton Journal and Vancouver Sun, as well as the National Post. Its influence on public opinion is probably greater than anything Fox News North will ever achieve. In defiance of Section 19, Postmedia Network seems to be owned by New-York-based GoldenTree Asset Management and other vulture funds. Their basic strategy is to look for troubled media companies and then scoop up the company debt — usually bonds — at a depressed price. The private equity firms snapped up CanWest’s risky bonds and in May 2010 they received court approval to take over the newspaper chain for $1.1 billion. Their interest is in speedy, double-digit returns, not quality, balanced newspapers. Here, too, the federal government is likely to believe the company’s claim it is Canadian-owned and controlled. Postmedia has a majority of resident Canadians on its board and gives legal assurances (the lawyers again) that the foreign owners will not be able to dictate company policies. But the Canadian directors are not likely to make decisions that will run contrary to the interests of the foreign owners, who are represented on the board. Meanwhile the Sun TV monster lumbers on. Quebecor’s newspaper chain already has a long list of social and economic conservatives writing on a regular or guest basis, such as Ezra Levant, Mercedes Stephenson, Michael Coren, Monte Solberg, John Snobelen (Mike Harris’ education minister) and Salim Mansur. Far-right shock-jock Charles Adler has been recruited from Corus Radio. They’re being primed to sprint into the Sun TV studio. The main threat is that Sun TV will magnify the already substantial Canadian right-wing echo chamber. 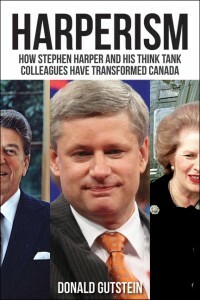 The Harper Tories issue talking points that are picked up by the conservative media — Sun TV, National Post, talk radio, Maclean’s, Sun newspapers, Postmedia commentators — and bounced back and forth in the blogosphere until they become accepted as facts. And Harper moves his agenda forward. Worries that Sun TV will be a Conservative attack dog were fuelled by the hiring of Jason Plotz from the Prime Minister’s Office. Plotz was in charge of issues research and provided the material the government needed to go after the opposition. Lurking behind the Fox hysteria is an even bigger threat to democratic media. Rupert Murdoch waits patiently as Stephen Harper sets out to create Murdoch-friendly ownership regulations and a more compliant regulator. Perhaps he’ll be meeting again soon with Murdoch in New York City to report on how things are going. This time, though, we’re not likely to find out.